These modern vintage wedding invitations feature vintage style graphics and typography. The background is a simple one color. The corners have an elegant rounded finish. There are 3 main color options: Blush, Mint and Cream. The vintage flourish can also be foil-pressed. Blush – Blush pink background. Foil option is Gold. Cream – Cream background. Foil option is Silver. 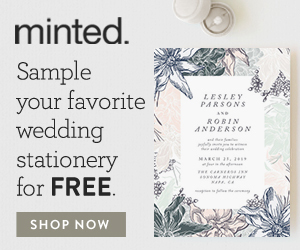 Letterpress Options: These invitations can also be letterpress printed onto 100% cotton. The letterpress print is available in 1, 2 or 3 colors. The colors are Navy, Stone and Vintage Green. Trim: The default trim is the Rounded Corners. You can change this to Straight Edge or Waved Frame. Back Options: The back of the invitations are white. Additional options for the back: a solid color, a flourish pattern, text or photographs. Envelopes: A white envelope is included. 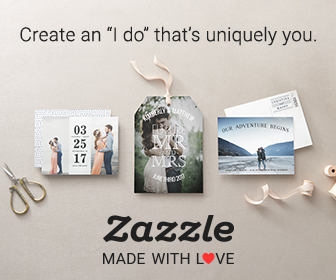 You can also choose to purchase Speckletone Kraft or Silver Envelopes, envelope liners( gold, silver or a coordinating pattern), Skinny Wrap (wrap around) address labels. Your guest’s addresses can be printed directly onto the envelopes. Your return address can be printed on the back flap. Personalized matching postage stamps are also available. Matching Suite Items: Some of these are available in foil and letterpress. These modern vintage wedding invitations have been designed by GeekInk Design.